And we were excited?. Reallyexcited! I was fishing in the 19thannual Chesapeake Bay Fall Classic hosted by the Maryland SaltwaterSportfishermen?s Association (www.mssa.net) The MSSA mandate is to protect and enhancerecreational fishing and conserve marine resources. Every year, for years, they have a number ofoutstanding tournaments for Marylandfish species. 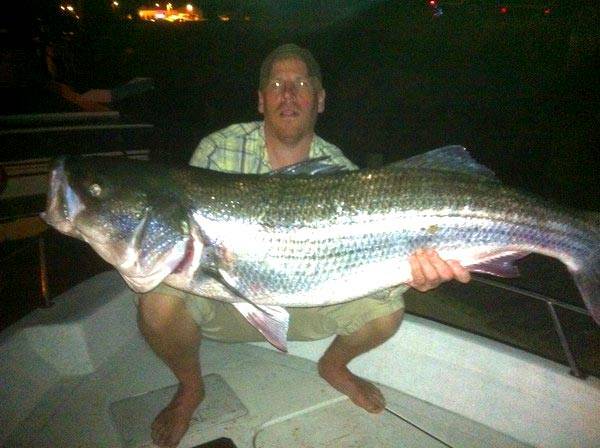 Fall time in the Chesapeake Bay is THE time for Giants? Locals call them, rockfishor linesiders, you might know them as Striped Bass. I heard these fish grow big but had no ideahow large these fish can actually get. IGFA ? International GameFish Association just approved the latest challenge for the All-Tackle WorldRecord Striped Bass at 81 lbs 14 oz caught by Gregory Myerson in Long Island Sound Connecticut. Almost 82 lbs!!! That is one huge animal! However, at this year?sChesapeake Bay Fall Classic, we were hunting for her grandmother! I was fishing with www.Alltackle.compresident Keith Fraser, and 2 of his fishing pals based out of Annapolis Md. My alarm went off at4am. I was crashed out on Keith?s couchand promptly got layered up for day 1? the temp gauge on Keith?s truckregistered a nippy 36 degrees and the wind was screaming. We made it to the boat, loaded up and headedout. The tournament had a recordturnout with 250 boats entered? boats from Maryland(of course) boats from Pennsylvania and Virginia to name 3. Our plan was to run about 40 miles to ourfirst spot. I?ve had the opportunity tosee a lot of weird things on the water, from techniques and rituals to bait andtechnology. But what I was about towitness literally made me sit back and watch in awe! Fishing for Stripers is ? ummm? interesting. The basic set up is that ofyour regular planer-board system. Using compression clips, you let your linesrun out different lengths. The longest lineback is placed closest to the planer board and shortest closest to the boat. Thing is, you don?t just use 2 rods? whenrunning this trolling system, we ran 16 rods - 6 on each planer board and 4 outthe back? I saw boats running 25-30 rodsat one time! With 2 anglers!!! The system is ingenious! I took the helm and watchedas Keith, Sean McCarthy and Bob McConnell expertly put the lines out ? eachline precisely to length to avoid any chance of a tangle. 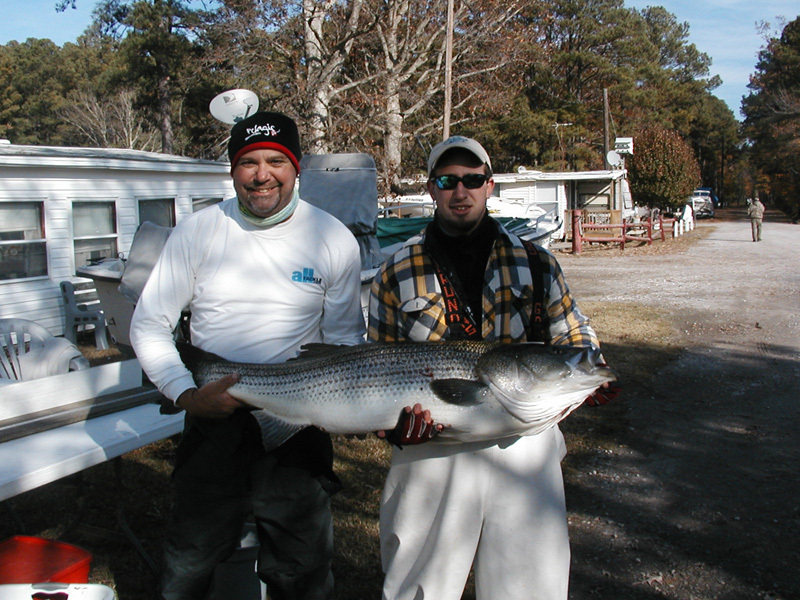 What surprised me was the bait of choice by Chesapeake anglers. Big Rockfish feed on schools of Menhaden and whatwe were deploying looks nothing? nothing like Menhaden. 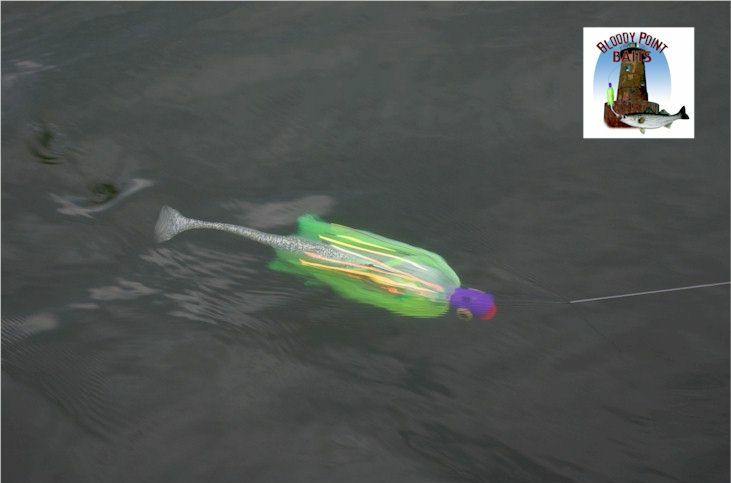 Bloody Point Baits manufactures both theUmbrella rig and the Parachute jig heads used in fishing for striped bass. They look like animated cartoon characters inMylar dresses, however to large striped bass, they are CANDY! Though we were marking fishconstantly, We had a tough day . Bob jumped on the rod for our only striper ofthe day ? a twenty plus pound fish. Wecaught it later in the day and decided we?d live release her after she wasweighed in.. With the water temp in the mid 50s striped bass seem to be quitehearty. We filled the below deckcompartment of Keith?s boat with fresh seawater, added some Rejuvenate and keptthat fish alive until lines out and weigh in was complete. MSSA Executive Director DaveSmith invited us to stay the night on Solomon?s Island which turned out perfectas it was seriously closer to our original destination fishing spot? it wasalso key, as we were able to see the day money fish which were weighed. Keith?s regular fishingpartner approached him weeks before asking if he minded he fish with adifferent partner for that tournament. Keith kindly obliged. What welearned that night with Dave, is Keith?s partner, Steve Dodson wanted to fishwith his son (one last time) before he was to head into the Navy. Well what proved to be a great father son?last tournament? ended up being one of the more heartwarming stories from thewater. Mid-day Steve and his son Mikelocked horns with a giant Striper? GIANT. This fish ended up weighing just over 51 lbs and at the end of day 1 wasthe tournament leader? Dave Smith was ecstatic? our crew was now officiallymotivated!